The Bridgestone Dueler M/T has what it takes to conquer just about every type of terrain imaginable. For serious off-road performance, the Dueler M/T offers ferocious off-traction and durability. Extra large and deep (16/32" to 18/32") tread delivers rugged traction even in the worst conditions. the continuous contact center tread blocks optimize the ride quality and keep tread noise to a mininum for the level of traction offered. The sidewall protector rib gives added protection against off-road hazards. The Dueler M/T is available in LT-Metric and flotation fitments to meet the demands of the serious off-road vehicle owner. The sleek styling features your choice of raised outline white letters or serrated black letters. 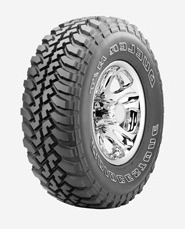 The Dueler M/T also carries Bridgestone's 30 day test drive guarantee.